Let me just clarify that I am not pregnant. I am doing some intensive spring cleaning at my house. As I was getting rid of stuff, I found some things I used with Kay, my first child, that I didn’t use with my second, Elle. This list might help some new mothers or expecting mothers decide what products they need and want. And later this week I’ll have baby products I love. Diaper pail. Totally loved it with our first. Then we started tossing diapers in our kitchen trash that has a lid. Plus, that’s the trash we take out most often, like every other day. If it’s a stinky one, we use grocery bags to tie it up. So when Elle came around, we never brought out the diaper pail again. Diaper trash bags. I used to keep rolls of diaper trash bag and dispenser specifically made to toss stinky diapers. It came in handy when we were out in public or even containing wet or dirty clothes from diaper or potty training accidents. Now I just use grocery bags that I keep in the car and one in my purse. Diaper bag. Even though they make adorable diaper bags now, I still prefer to use large purses or totes. You can find diaper bags that look like purses, but most are pretty expensive. So I just learned to consolidate my diaper bag and put it all in my purse. Changing table. 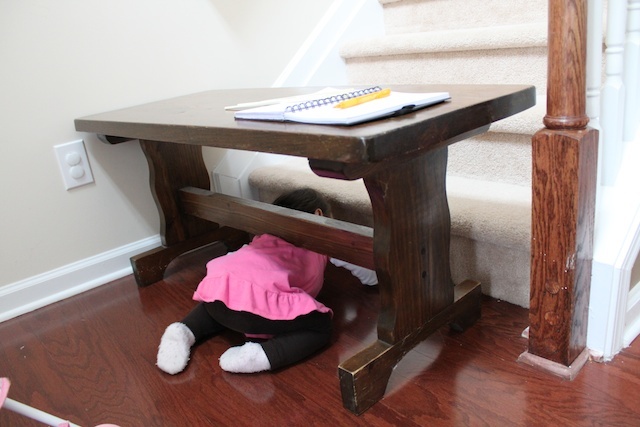 We used a changing table with our first child until she was about 18 months. Since then we have been changing diapers on the floor using a changing pad, or changing diapers on beds. Umbrella strollers. This was handing on vacations or a quick stroll around the neighborhood. But maybe it’s because we just have a cheap one, but the handles are actually too short for Nathan or I to push. Wipes warmer. None of my kids ever complained about the wipes being too cold on their bums. Nursing cover. I tried them. I even made a few of those fancy nursing covers . They never worked very well for me. Partly because I live in the South where it is too dang hot. I usually just cover up using my shirt. I learned to be discrete without a nursing cover. Plus I don’t nurse in front of people or in public places. Bouncers. We have a baby swing. I usually put my child in that or on the floor with a play mat. Infant shoes. I use socks on infants until they are about 9 months. Other than for the visual appeal, infants aren’t walking. So why the shoes? Safety gates. I know the importance of baby safety gates. I just never used one in my house. It’s because I can’t find one where we don’t have to mount it into the walls for the type of posts and rails we have on our stairs. We have always taught our kids to go up and down the stairs correctly. And we sometimes we use our entry bench to block the stairway. See pictures above… Our sneaky Elle has learned to get pass it. » Tell me… What are some baby products you used with your first but not your second? And which baby products you found useless? I am with ya! Actually, I never used a lot of those products with my first b/c we were living in a small one bedroom apartment and didn’t have room. I am SO OVER the diaper bag look- i have several expensive ones that are just sitting in the closet (gifts) that i need to re-gift- ha! I just have to comment with ya about the umbrella strollers. If you are tall (Im 5 feet 8 inches and my husband is 5 feet 9 inches), then these umbrella strollers are completely uncomfortable! I bought one thinking it would be much better than our bigger stroller, but hate using it because the handle is so far down. Now we just use a wagon to pull him around at the zoo and to the park. I like your list. I had to compile one for my sister when hers was born because you dont want people to waste money on “unneccesary” baby things! I don’t know if its because i thought all of that stuff was impractical or because i didn’t have the room when we had our first but i never used them. Although we used a bouncer instead of the swing our first hated the swing and our second used the bouncer as well..
the BOPPY pillow…sure they have covers but you can’t wash the actualy pillow and spit up pee and throw up sure seep thrugh cotton easily. You can wash a boppy right in the washing machine, then a hot dry cycle. I have two boppys and love them! I would have to disagree on the nursing cover. I LOVE mine. I even nursed in church since our cry room has a clear glass window. People would walk by to “ooo” and “ahhh” over the babies, but there was nothing to see in regards to baby and I (thank goodness)! I do agree with Lisa though, the boppy was a WASTE! I never used those covers that go over the carseat to keep the baby warm. I had an Eddie Bauer car seat, and the pretty carseat covers they sale at Babies R Us did not work properly…maybe it was just the type of car seat that I had, but it was too small and would kinda “pop” off, so we just used big fleece blankets! I am SOOO with ya on the diaper pail! I never even got one, because I had been to friend’s houses and smelled the pails, we empty our trash every night, so dirty diapers never even really start to smell it up if you tie it in a walmart bag! I completely agree on all the items I never used for #2! Felt so good to get rid of that stuff. Only difference, I loved Robeez – you could consider those infant shoes but they worked like a charn keeping socks on and looked cute too! It’s so funny because even though my second child hasn’t been born yet, I’ve already made the decision not to use some things I used with my first, some of which you listed. Like the diaper pail. I got a diaper champ at my baby shower and thought it was very handy at first. Then my husband, who is the one that would take out the trash, informed me that it was really disgusting to take out a trash bag full of dirty diapers. The smell was overwhelming once it came out of the diaper pail, especially since it wasn’t taken out daily since it never filled up as quickly as the normal trash. Also, I way prefer large purses/totes to diaper bags and for the same reasons you do–cheaper and many times, cuter. I completely agree about the shoes. My little one never wore them til she started walking. I do have a diaper bag though but I don’t carry a purse. Just a keychain wallet and my cell…so my circumstances are different. I never used a playpen or a baby gate either. I will say that for the first 4 months that Boppy saved my back, arms and sanity. I also removed the cover and washed it and the pillow without any problems. We use a small trash can with a lid and a plastic grocery bag for our diaper pail. Those monstrous diaper genie things hold too many and stink too fast–might be great for triplets 🙂 No nursing cover, bottle warmers, or wipe warmers here either. We did use one of those swaddling blankets for the first three months and found it helpful but only for that limited time. I thought the change table/baby bath was a COMPLETE waste of money. We are having our second overseas and I have literally bought everything I need 2nd hand. We bought an el cheapo baby bath because she will eventually just be going in the shower or bath with me (like we did with our son). We used our change table baby bath maybe 10 times and then it became stacking space. The only thing I bought that was MAYBE a necessity was a second hand change matress. I got one for $10 second hand, it has the sides that prevent littlies from rolling off. And we have a decent stroller that can go on the beach or to the mall. It’s not pretty, but it will do the job. The one thing I could not live without is a baby sling or similar. I carried my baby everywhere, even when I was at home. He loved being close to me and I intend doing that with this one too!